This program runs year-round and is available on a first-come, first-serve basis. Please contact Pastor Corilee if you are interested in being paired with a mentor. The goal of this program is to have each participant paired with a Christian mentor whom they will meet with on a weekly, bi-weekly, or monthly basis. Their mentor will prayerfully seek to help you grow in your experience with horses as well as in your relationship with the lord! 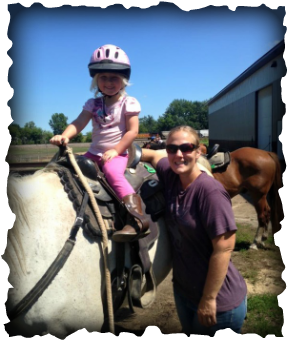 Destiny Youth Ranch is providing individual riding sessions for girls and boys ages 6 years to adult. This program is designed for those who would like to have one-on-one training with horses while having a Christian mentor to spend time with, learn from, and look up to! We will provide one horse and one mentor per person for sessions at the ranch. Our sessions are organized on a first-come, first-serve basis. You may sign up to attend for a shorter period of time, but your mentor needs to be aware of the time you are willing to commit, at we generally have a waiting list. Free-will donations are accepted, but not required for you to participate. We are often asked what we'd suggest for a donation ($10-20+ per session), we we don't want cost to keep anyone away. DYR does not have paid employees, so we want you to know that all donations will go toward upkeep of the horses and toward the growth of the ministry. We are so very grateful for our heated indoor riding arena to use throughout the year and are very excited for the improvements of a kitchen, tack room, bathrooms, and soon-to-be offices and bunk areas. Please contact Pastor Corilee by texting her at (605)553-7422 or email us at destinyyouthranch@gmail.com in order to schedule your appointments! The only requirement to participate in this program is that you have an open heart and want to attend. Each session will look a little different. Some days, you may ride in the arena, while other days you may trail ride or assist with ranch needs. We will seek to make enough time for horse/ranch stuff as well as devotional time. We would encourage you to visit with and get to know your mentor and let them know if you have any questions or prayer requests. Sessions will run approximately 1 hour. We will consider allowing two students to attend together with one mentor. We will also consider family groups depending on their ages, relationship, and how well they can focus during a session. We are currently looking for more interested Christian horse enthusiasts that would love to mentor young people. We need experienced Christian adults or mature teens that have (preferably) volunteered at DYR camps in the past--we are looking for gals AND guys to be mentors! Beth and her family moved to Alvord in 2014. She was eager to begin working as a mentor in our program as soon as they got to town and we have been very grateful to have her on board. She has 2 sweet little girls (Ariel and Rachel) and a husband at home. She has always enjoyed being around horses. Corey joined the ranch's team in 2014 and has been doing a great job with the kids and the horses. 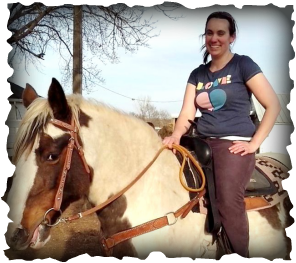 She looks forward to working with young people & helping them grow in their comfort around horses and in their faith. 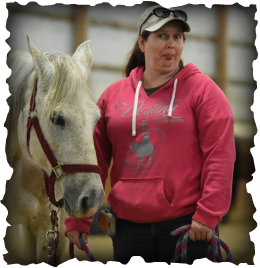 Anna really enjoys being out by the horses & helping kids feel comfortable around them. She often leads the tack & riding safety portions during camp & helps during most of the trail rides. She works hard & has helped with so much at DYR. Lambs = Baby sheep (lambs) naturally desire to be in groups & follow a leader. They get to know their shepherd's voice so that when he calls, they listen - they know he cares for them & protects them from harm - he will even carry them on his shoulders. Jesus is compared to a shepherd in the bible as he cares for each & every one of his children - He notices if even one is far from him. He would leave a large flock to find the one lost lamb because each one is so precious to Him. A good mentor will encourage you to pray & read your bible so you can learn to hear His voice and know for yourself what God's desire for you is on a daily basis. Foals = A baby horse (foal) can stand up almost instantly after it is born, but it isn't very graceful! It will continue to follow its mother around and copy what she does for months/years in order to learn how to behave in the world. A horse goes through a season of training in order to become kind & respectful toward the wishes of his rider. All christians are growing from glory to glory - no matter how long they've been saved! Having a mentor/friend to be there for you regularly to teach, encourage, & pray with you is a beautiful gift. It is not to be assumed that your mentor is perfect, but they will do their very best to guide you & set a good example for you to emulate.